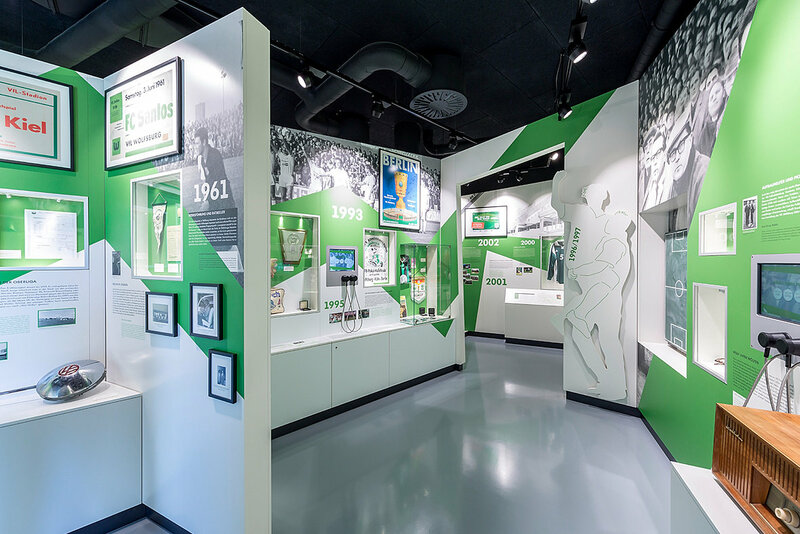 The VfL Football World (VfL-FußballWelt) in the AOK stadium in Wolfsburg, Germany is an interactive world of experience across 800m² dedicated to the Bundesliga club, its history, stars and of course its fans The rooms and exhibits are illuminated with lighting tools from TRILUX, an exclusive partner of VfL. 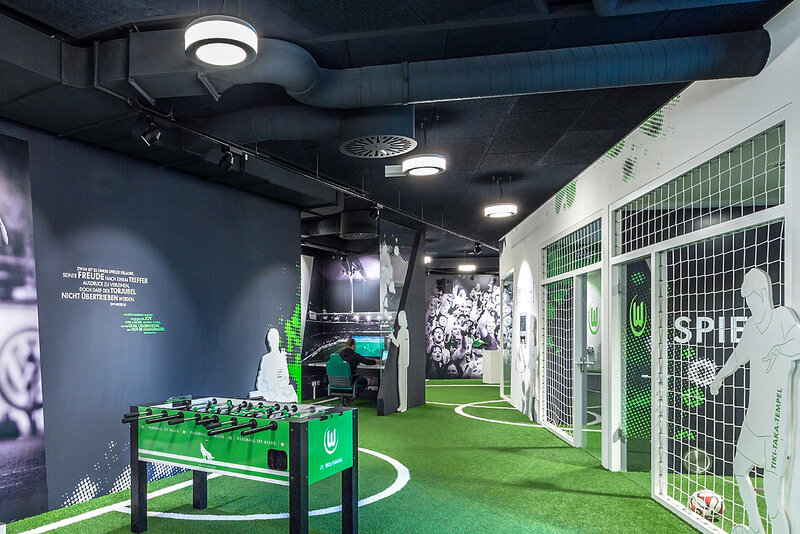 The exhibition concept and design of the VfL Football World is uniquely special – not only tributes and trophies are displayed but visitors can also slip into the role of a football player and progress through a course with several interactive stations. Exhibition lighting must be accordingly suitable for highly different tasks and the spectrum ranges from the emotional display of objects to general lighting of the rooms and corridors and robust luminaires in the training area. Such complex demands were coherently satisfied with luminaires from both the TRILUX and Oktalite product ranges, and Oktalite was also responsible for the complete lighting design. 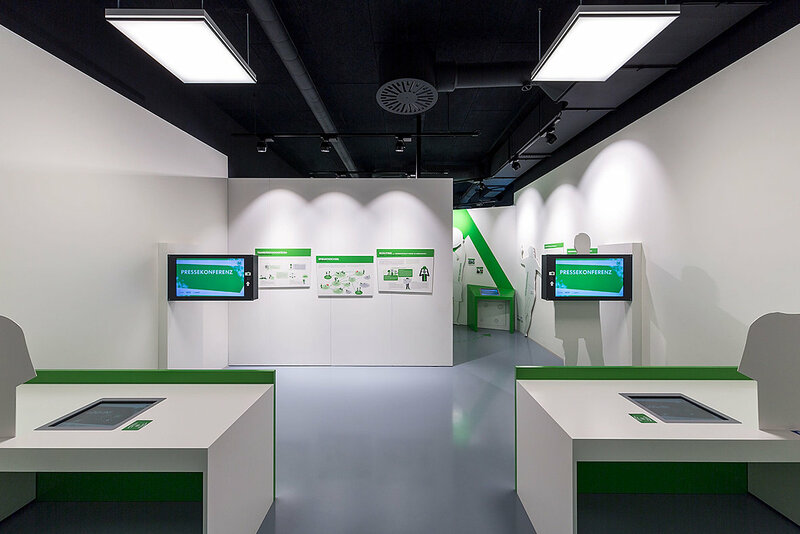 Team spirit was not only needed for a contextual look at the topic of football but also for technical implementation of the exhibition and an ideal reference project was also created for the TRILUX Group philosophy of "Simplify Your Light". The rectangular Belviso LED sets a geometric contrast to the circular Polaron LED, seen here as a project-specific pendant variant. The Taro LED spotlight series from Oktalite adopts a central role for the exhibition lighting. The range features interchangeable reflectors with beam angles ranging from narrow distribution spot to diffuse flood. The VfL Football World benefited throughout from modern LED technology, beginning with round Polaron LED luminaires on the ceilings and Belviso LED planar luminaires for general lighting, Taro and Taro mini LED spotlights on tracks for the display light and finally ball-proof Mirona LEDs. For the operator that meant low energy consumption in addition to further advantages because the products benefit from long lifespans and low maintenance. However, not only efficiency but also the quality of light was an important design criterion for the exhibition lighting. Taro LED spotlights (the Oktalite Best Colour version) were installed to ensure a realistic rendering of all colours, meaning the luminaires integrate LEDs with especially high colour rendering. The green club colour of VfL Wolfsburg was therefore given an especially brilliant hue, firing on the loyalty and hope of the fans for their wolves. A long access zone with stairs inside the stadium leads to the Football World. Taro mini LED spots highlight the extensive wall decor that prepares visitors for the exhibition area.